In this episode of “Surviving to Thriving: Overcoming My Darkest Moment,” I talk with visual artist Col McGunnigle. As an award-winning graphic designer for 25 years, Col was at the top of her game, appearing in Vogue, Vanity Fair, Town & Country, and many other publications. So when a chronic illness hit in 2014, she was blindsided. At first she pretended she wasn’t sick, afraid no one would hire her, which led to a very dark place: lying face-down on the floor, feeling like she was being dragged behind a speeding car through ground glass. Col knew she needed to pick herself up (physically and emotionally), but felt trapped and unable to do so. 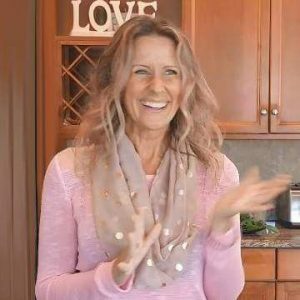 Listen in as she shares how she dealt with this difficult transition, and redirected her creative energy into a new form of artistic expression. Today Col paints for herself, intuitively allowing the imagery to emerge and uplift her. Rather than viewing her illness as an enemy, she sees it as something which has taken her on a journey into the unknown. Despite her daily challenges, Col has rediscovered her joy in painting, a process that fills her with delight. It is her wish that whoever takes home one of her paintings feels the same magic she felt while creating it. Her work has been exhibited in galleries in the Hamptons, Quogue and Providence, as well as in Europe, and appears in private collections throughout the United States. For more about Col and her art, visit www.soulcenteredart.com/.